and leaves of past warm years hide there. and hidden in the suburbs—now we are here alone. I feel a latent growth. grows into us, into the peopleless hum. From Egypt, a poem depicting a narrator's return to a street where she used to live. Also from Egypt, this graphic story poses the question: what happens to a soul too long alone? Rrom Japan, a poem addressed to the earth during an earthquake. Published in Words Without Borders' June 2010 issue: The Queer Issue. Aleksey Porvin is a contemporary Russian poet. Translations of his poems can be found in Ryga Journal, St. Petersburg Review, SUSS, The Dirty Goat, World Literature Today, and The New Formalist, among others. His poetry collections include The Darkness is White (Argo-Risk Press, 2009) and Live By Fire (Cold Hub Press, 2011), which was his first book published in English. His poetry was shortlisted for the Andrei Bely Prize and The Russian Debut Prize. He lives with his wife in St. Petersburg. Listen to the pronunciation of the author's name. Look at the poem in the original Russian, which rhymes. Find out about the unusually-named neighborhood where translator Peter Golub grew up, and why he prefers to call translation "transcription," in this WWB interview: A Kind Of New Alchemy: An Interview With Translator Peter Golub. In Porvin's “Soul, you are a street,” as in much of Porvin’s poetry in general, his lyrical energy of abstract, metaphysical nature always departs from the specific and concrete. The central metaphor of soul-street creates a trajectory of growth (in the last line, literally, that of a stem that “grabbed the sun” between the street’s cobblestones), as well as of a spatial expansion of memory, the live memory of Russian poetry in which this “secret stem,” as Nabokov would call it, takes root. Discussions of the soul, and, in particular, of the Russian soul, are, perhaps, more common in Russia than in other parts of the world. "Here, in Europe, you like to be rationalist. We are not so rationalist." Watch this interview with Russian author and radio host Viktor Erofeev, who wrote a book entitled "Encyclopedia of the Russian Soul" and hosted a Radio Svoboda (Freedom) program of the same title. For many more discussions of the Russian soul, see the Playlist. 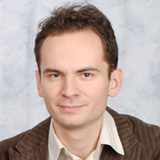 Read more work from Aleksey Porvin, published in many journals, including . . .
Or, buy his collection, Live by Fire, published by Cold Hub Press. Read a different Russian poem translated by Peter Golub, "Drawings on a Soccer Ball,” by Andrei Sen-Senkov. Want more? Take a look at Peter Golub and Ainsley Moore's translation of Sen-Senkov's collection, Anatomical Theater (In the Grip of Strange Thoughts), on Amazon. 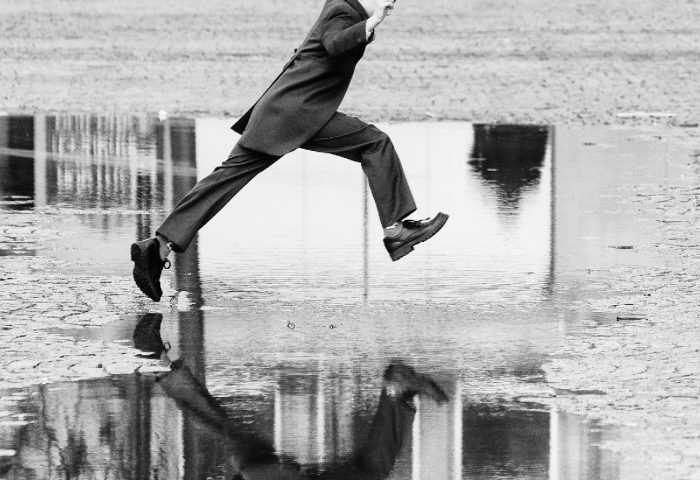 Look through a gallery of photographic streetscapes, including Karl Wood's Jump, of a man in a suit leaping over a puddle. Aleksey Porvin is himself a translator of other poets into Russian, including Chicagoan Jaswinder Bolina, perhaps best known for his essay, “Writing Like a White Guy.” Find out how the two poets connected in this interview with Bolina. Many people, both in and outside Russia, have tried to define the Russian soul. Read some of what they've said below. For more on Russian poetry and the Russian soul, read this review from the New Statesman: "The Russian soul reawakened: startling revelations in a new anthology of Russian poetry." "Address to My Soul", by Elinor Wylie, in which the soul is a "dissolving star"
"Things Elude Me," by Iman Mersal: From Egypt, a poem depicting a narrator's return to a street where she used to live. In English, the phrases "the street" and "the streets" often carry a suggestion of urban life and potential danger; some of the poems below include descriptions of crime, four-letter words, etc. "A Side Street," by Louis Untermeyer, describes girls watching the street, waiting for something "more than what is merely moving and alive." "Alameda Street," by Douglas Kearney, in which boys long to "leave a mark"
Visit our playlist of videos on YouTube, or listen to individual songs and read their lyrics below. Kanye West, Street Lights (2008), As in Porvin, an evolving sense on the self in the lyrics: "Do I still got time to grow? / Things ain't always set in stone." "Amina," by Iman Mersal, addressed to a "perfect friend"